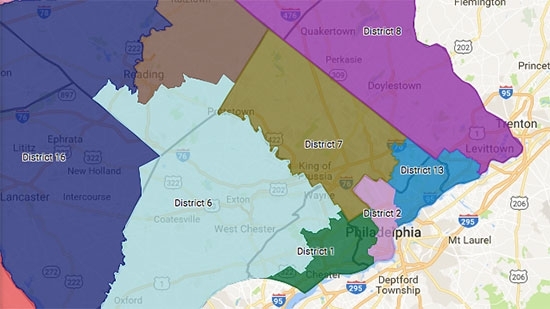 Pennsylvania Governor Tom Wolf submitted a congressional districting map to the PA Supreme Court today. He said, "From the outset, I have made clear I wanted a map that was fair and removed the partisanship that Pennsylvanians have been forced to live under since the 2012 elections. This map takes features from Republican and Democratic submissions, while still meeting the court's orders and opinion, to provide Pennsylvanians with a fair map. While my preference would have been for the General Assembly to send me a fair map, I believe this map sets forth a new standard of fairness." Wolf's map was analyzed by Tufts University mathematics professor Moon Duchin and was found to have no partisan skew. You can look at the plan in detail at Congressional Districts Map Proposal and Read Professor Duchin’s full report (PDF). The PA Supreme Court can decide to accept this map or draw one of their own. The Philadelphia District Attorney has announced a new policy regarding how his office will handle cases of marijuana possession. DA Larry Krasner instructed his assistant DAs not to purse charges of simple possession of marijuana. The office has also dropped charges in 51 pending cases. The policy doesn't include possession with intent to deliver or sales. Philadelphia laws have already decriminalized possession of a small amount of marijuana, punishable by a citation. However, about 10 percent of the time someone is caught with pot they are still arrested and charged with a misdemeanor. Krasner said, "I did it because I felt it was the right thing to do. We could use those resources to solve homicides." A Philadelphia middle school was on lockdown for hours Friday morning after there were reports of a student with a gun. Police were called to Wagner Middle School at Chelten Avenue and 18th Street in West Oak Lane just before 9 a.m. after student told the principal she saw another student with a gun. The school was placed on lockdown as police officers searched the building classroom by classroom. No one was allowed in or out and some nervous parents gathered outside. Eventually, after 11 a.m., police concluded the search after finding a toy BB gun. Police say that no was in any danger and no one was injured. The school had a prescheduled noon dismissal ahead of the holiday weekend. Tonight, showers this evening, clearing out overnight and getting much colder, low 27. Saturday, Winter Storm Watch, rain and snow starting in the afternoon, changing to all snow, high 38. A few inches expected.